It’s interesting how food trends come and go. Forbes magazine says from new flavors to mother less meat the number 1 food trend for 2019 is that more people will stay at home to eat! Eating out isn’t just a big dip in your pocket book. It can also be detrimental to your health. Larger than necessary portions, too much fat, sugar and all that sodium! Although we have a few local healthy vegan restaurants that we visit, we eat most of our meals at home these days. Since we eat an oil free, sugar free and low sodium diet you might be wondering how we flavor our food? Once you get the overload of sugar, oil and salt out of your diet you can actually appreciate the taste of fresh natural food. We still enjoy embellishing our food with fresh herbs, homemade salsas, salad dressings, salt free seasonings and yes indeed flavored vinegar! Read on to see how you can get 2 free samples of California Balsamic Vinegar! We have come a long way from the days when the grocery store only had Apple Cider Vinegar and the fancier – Red Wine Vinegar on their shelves. Flavored Vinegars are a big trend. One of our favorite healthy ways to flavor our food is using a wide variety of flavored balsamic vinegars. I was introduced to California Balsamic Vinegars from my friend Chef AJ. As most of you know I am a member of Chef AJ’s Ultimate Weight Loss online program. She let me know that California Balsamic was in Sacramento at the Harvest Festival recently and she urged me to go check them out. I am so glad I did! 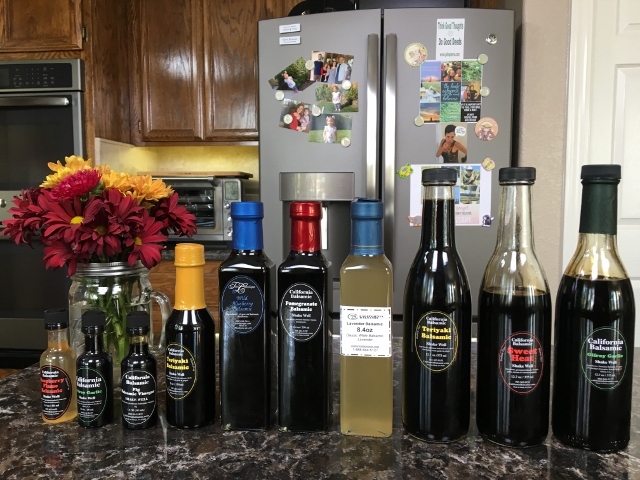 I had already received my first shipment from California Balsamic before the Harvest Festival and was enjoying the flavors I had chosen. At the Harvest Festival we met Thomas the owner who is super friendly and passionate about his business. He gets pretty excited over the flavors they have to offer and let’s you taste them all! Then comes the difficult part – deciding which ones to buy – I wanted everything! The vinegars are fabulous on just about anything from cooked vegetables and Chopped Salads to sweet potatoes and Nourish Bowls. California Balsamic sources their vinegar a 25 star balsamic from Modena, Italy – a custom balsamic made with an exceptionally high quality grape must from the Trebbiano and Spirgola grape that enhance flavor and texture. Then California Balsamic add their own creativity to make a wide variety of flavors. All of the vinegars are sodium free, gluten free and vegan. No added sugars in the dark balsamic savory flavors – the sweetness comes naturally from the grapes. I love that. The Apple Pie Balsamic does have a little maple syrup added to it. See the California Balsamic website for all the nutritional information. Get 2 free sample bottles of California Balsamic Vinegar! You can order online from California Balsamic which is located in Ukiah, California. 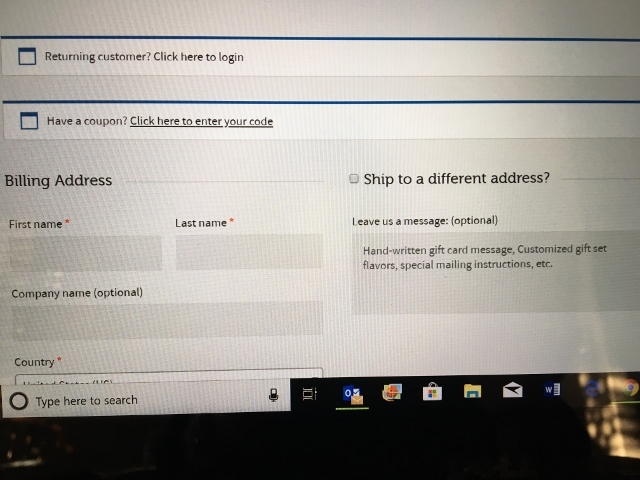 They have a flat rate shipping charge which is quite reasonable. Thomas made a special offer for Chef AJ’s subscribers and he is graciously extending that offer to the Nutmeg Notebook subscribers as well. When you order a minimum of one bottle of balsamic vinegar you will receive 2 free 1.6 ounce sample sizes in your shipment. You get to decide what the sample flavors will be! To receive your 2 free balsamic samples follow these directions upon check out. To the right of where you name goes there will be the Leave Us A Message Box – inside that box write Nutmeg Notebook and the 2 flavors you would like to try. (See the photo above.) It’s that easy! There is a bonus offer through the month of December 2018 – with each minimum $50.00 order you will also receive a free $10.00 travel bottle of balsamic vinegar – just put the travel size flavor you want in the message box. The California Balsamic vinegars will make wonderful holiday gifts. I have an Amazon Affiliate Recommendation Page see my favorite kitchen gadgets and household items I use. When you purchase items from my Amazon page you help support my work here without any extra cost to you. Thank You for your support. It’s December already – why does it always come as a shock? This year I am going to try and slow down a bit and enjoy the season with the grandchildren. I won’t let myself get overly committed and plan on making time to do the things that I really want to do. Wishing you all a lovely holiday season. Previous Post: « My Favorite Things! When we saw Thomas last November, he told us about his connection with Chef AJ. I’m delighted to hear how she’s expanded his business, and that he’s developing new products with herbs as a result of the response he has received from her hand her followers. He said he had several people shop at his booth this past weekend who heard about him from Chef AJ. One unique use I found for his Very Cherry Vinegar is on chocolate ice cream. Sounds very strange, but it’s fabulous. Give it a try. Thomas is a gem and we love his vinegars! Thank you so much for sharing your love of his vinegars! Hi Tami ~ I just found your website and have enjoyed 2 videos so far on your salads. Wow! Thank you for the inspiration! I’m very interested in these balsamic vinegars~so many flavors!! I’m thinking of ordering Chef AJ’s favorite sampler, but thought I might order a full size as well and get 2 more sample sizes. Which of the flavors would you say is the most useful (I guess that’s what I’m trying to ask)? I’m diabetic, so probably a more savory I’m thinking. Thanks for any suggestion you have!